The Seychelles are the perfect honeymoon and wedding anniversary destination for all those looking to enjoy beautiful beaches, sunshine, and total relaxation. You can find out all you need to know about your Seychelles honeymoon here! You can find the honeymoon offers and special treatments for each hotel on its listing page, below the price tab. Special discounts on the room price. Special couples’ spa treatment during your stay. Romantic à la carte menu for lunch or dinner, served on the beach. Special gift for the bride and groom. A pareo (beachwear) for the bride and a Creole-style shirt for the groom. One gift voucher for the hotel boutique. Welcome cocktail/sparkling wine, fruit basket, and various romantic touches to your room upon arrival. Complimentary private speedboat transfer (weather-dependent). Framed picture of honeymoon couple as a departure gift (picture taken on day of arrival or the day after arrival). Offers usually available to couples within 6 months of their marriage date. Please note: period of validity may vary, depending on hotel policy. More information is available in each hotel’s offer section. Valid proof of marriage must be presented. Offers and special treatments are available for wedding anniversaries, and can be booked on our website or on request. Please see the hotel description for details regarding dates and times. Below, you can find some of our suggestions for your once-in-a-lifetime island-hopping honeymoon and wedding anniversary in the Seychelles! Would you like to get married in the Seychelles? With Seyvillas, you can! We will organise your whole ceremony for you, including all the special treatments and features that you would like to have for your special day. 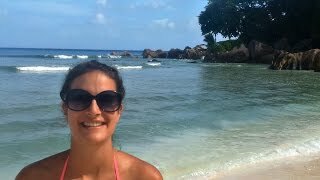 Have a look at the videos of our customers in Honeymoon or find out more by reading their travel journals! 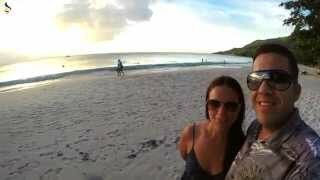 Here, you can see and hear the experiences of some of our clients who spent their honeymoon in the Seychelles.